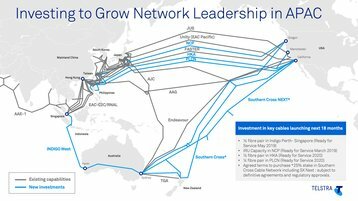 Australian telecommunications giant Telstra has considerably increased capacity of its submarine network stretching across the Asia Pacific. Additional bandwidth is a result of a large capacity purchase on the New Cross Pacific (NCP) cable, as well as a further investment in the Faster submarine cable system. According to Michael Ebeid, group executive for enterprise business at Telstra, the company has made substantial efforts to boost its network capacity, with strategic investments in infrastructure across the Asia Pacific region following its 2015 acquisition of Pacnet. As we noted at that time, the acquisition gave Telstra control of almost two dozen data centers, along with strategic submarine network routes. The latter included the EAC-C2C system, with design capacity of up to 30.72Tb. 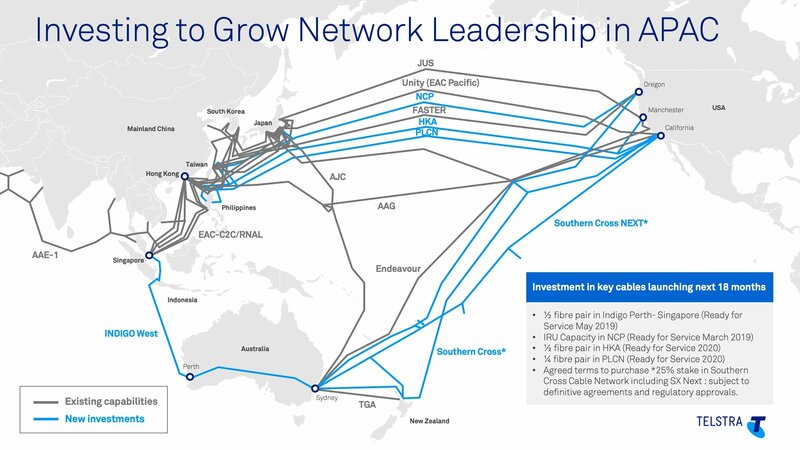 Over the past 12 months, Telstra has also made efforts to improve its capabilities on routes between Asia and the US, with a half fiber pair investment in the Hong Kong Americas (HKA) cable and a 6Tb capacity purchase in the Pacific Light Cable Networks (PLCN) cable. Both are due to be completed in 2020. In December 2018, Telstra entered into an agreement to purchase a 25 percent stake in the Southern Cross Cable Network (SCCN), subject to documentation and regulatory approval. This includes acquisition of substantial capacity on both the existing SSCN and the upcoming Southern Cross Next cable systems. Telstra says multiple investments in SCCN, HKA, PLCN and INDIGO will grow its submarine cable network ownership by more than 25Tb, once complete. “Capacity demand on our international network has almost doubled over the past two years to over 200Tb, driven by the explosion of cloud computing, video streaming and e-commerce,” Ebeid said.